Successfully Added 9-Inch Portable DVD Player - Universal Disc Support, FM Radio, Analog TV, E-Book Function, Game Play, 270-Degree Screen Rotation to your Shopping Cart. This multifunctional 9-Inch portable DVD player is the perfect media tool for entertaining your kids during upcoming road trips and family holidays. Featuring an absolutely stunning 9-Inch TFT LED display, this portable DVD player lets you enjoy all your favorite media in breathtaking 1280x800 resolution – bringing along vivid color and stunning detail for a top notch media experience. Its display can be rotated 270 degrees, providing you with great portability and assuring that you’ll be able to watch your movies from the perfect angle no matter where you’re located. 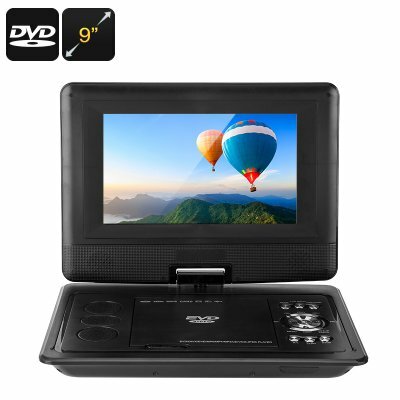 With its region free disk support, this 9-Inch portable DVD player is capable of reading any DVD out there, allowing you to purchase new movies whilst abroad and letting you instantly enjoy them on the road or once back on the camp side or cottage. Besides being an ordinary DVD player, this media player allows you to play games, listen to the radio, read text files, and even watch regular analog TV – making it a truly multifunctional device that packs unlimited forms of entertainment. Coming with its own remote control and gamepad, this portable DVD player can be conveniently turned into a 9-Inch game console, allowing you and your kids to enjoy amazing games at any given moment. Its FM radio feature additionally provides you with the possibility to listen to the latest tracks, weather forecasts, and talk shows on the radio while analog TV support lets you watch regular series once you finished your last DVD. Thanks to its Anti-Shock feature, you’ll be able to enjoy all media on the go without experiencing any interruptions. By supporting up to 16GB of external data through USB or micro SD card, this 9-Inch DVD player lets you carry along and enjoy years’ worth of games and media on the go – assuring that you’ll never have to be bored again. With its 1500mAh battery, you will be able to enjoy numerous hours of continuous movie watching or play time without needing to worry about running out of juice. Two 2 Watt stereo speakers that deliver audiophile grade music further enhance your media experience. With its 3D movie support, this 9-Inch portable DVD player allows you to enjoy a truly cinematic experience no matter where you’re at. Perfect for entertaining your kids or passengers on to go, or to be used to watch TV and listen to the radio during your upcoming camping trips – with this portable DVD player at your side you’ll always be able to enjoy the latest media and entertainment on the go. This 9-Inch portable DVD player comes with a 12 months warranty, brought to you by the leader in electronic devices as well as wholesale electronic gadgets..
Arabic: - 9-بوصة المحمولة دي في دي - Chinese Simplified: - 9 英寸便携式 dvd 播放机 - Czech: - 9palcový Přenosný DVD přehrávač - Danish: - 9-tomme transportabel DVD spilleren - Dutch: - 9-duim verplaatsbaar DVD speler - French: - Lecteur DVD portatif de 9 po - German: - 9-Zoll-Portable DVD-Player - Hebrew: - נגן DVD נייד 9 אינץ - Hindi: - 9 इंच पोर्टेबल डीवीडी प्लेयर - Italian: - 9-inch Portable DVD Player - Japanese: - 9 インチ ポータブル DVD プレーヤー - Korean: - 9 인치 휴대용 DVD 플레이어 - Malay: - 9-inch pemain DVD mudah alih - Norwegian Bokmål: - 9-tommen transportabel DVD spilleren - Romanian: - 9-inch Portable DVD joc - Russian: - 9-дюймовый портативный DVD-плеер - Spanish: - 9-inch Portable DVD Player - Thai: - เครื่องเล่น DVD พกพา 9 นิ้ว - Turkish: - 9-inç taşınabilir DVD oyuncu - Vietnamese: - 9-inch Portable DVD Player.